'They called it Enamour. It turned minds, sold merchandise, and swayed elections. And it did its job far too well...' In the city-state of Geath, the King lives in a golden hall, and the people want for nothing. Everyone is happy and everyone is rich. Or so it seems. When the Doctor, Amy and Rory look beneath the surface, they discover a city of secrets. In dark corners, strange creatures are stirring. At the heart of the hall, a great metal dragon oozes gold. Then the Herald appears, demanding the return of her treasure... And next come the gunships. The battle for possession of the treasure has begun, and only the Doctor and his friends can save the people of the city from being destroyed in the crossfire of an ancient civil war. But will the King surrender his new-found wealth? Or will he fight to keep it...? 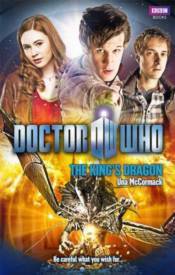 A thrilling fantasy adventure featuring the Doctor, Amy and Rory, as played by Matt Smith, Karen Gillan and Arthur Darvill in the spectacular hit Doctor Who series from BBC Television. DOCTOR WHO: INSIDE THE TARDIS WORLDS OF DR WHO SC DOCTOR WHO: LAST OF GADERENE 50TH ANNIVERSARY ED.